Roger Carswell has a burden to reach the lost but he is also concerned that Christians should love those without Jesus. 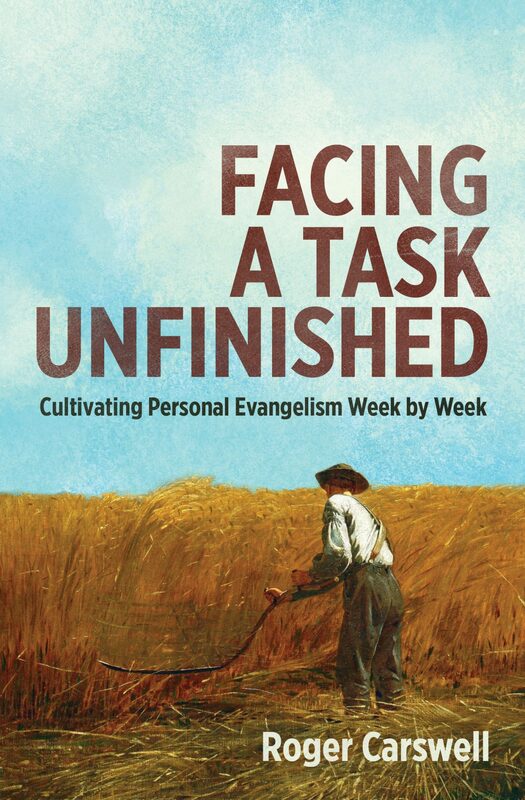 His book, Facing a Task Unfinished, published by Christian Focus, is a devotional journal of 52 Bible passages, prayers and hymns. Here are three of those devotions. Do not read this as you would another article; meditate on the Bible passages, pray the prayers and add in your own. Let’s take one devotion each week and ask the Lord to cultivate in us a heart to share the gospel. The people who heard Paul preach in Galatia, who were then converted, didn’t physically see Jesus crucified. So when Paul writes ‘before whose eyes Jesus Christ was clearly portrayed among you as crucified’, he is reminding them of the messages they heard from Paul himself. Paul preached in such a way that he turned people’s ears into eyes and they saw the truth. People’s minds are picture gal­leries more than debating chambers, but in portray­ing truth with words, we must make sure that we are making much of Christ and him crucified. It is when people ‘see’ Christ on the cross that they are drawn to him. Having been lifted up on the cross, he draws people to him. Human pride is such that we try to make our own deeds part of the process by which we are saved. Scripture, time and again, warns us against this. Christ, and he alone, saves people. I praise you Heavenly Father, for all that Jesus accomplished in those three days’ work, where he was crucified, buried and raised from the dead. Help me, as I go into each new day, to so speak of the Lord Jesus that people may see him with the eye of faith, and turning from their sin, trust him as Lord and Saviour. May Jesus be my passion, my desire, my love, my reason for speaking and my focus in witnessing. I pray for his glory alone. Amen. Please read John 4:34-38 and Luke 10:2. To look on the fields and see them white all ready to harvest is deeply moving, but if labourers are few, the scene becomes distressing. The harvest is ready to reap or to rot. Millions are empty, lost and heading for an eternity without Christ which is worse than we can ever imagine. Jesus here spe­cifically tells us for what to pray. He understands the serious need for evangelists. Jesus does not here say that we should pray for more prophets, pastors or priests. The great Bible teacher, C. H. Spurgeon, explained why, ‘I would sooner pluck one single brand from the burning than explain all mysteries.’ So let us think of particular mission fields at home and abroad; amongst different people groups, and pray that God will send out labourers into those harvest fields. If some areas appear closed, then let us pray that God will open up those harvest fields. When Jesus told us to pray in this way, he was say­ing that we can speak with God, who influences his­tory, changes nations, and acts in answer to prayer. And no one may rest till the ‘harvest home’. And share in the glory of the ‘harvest home’? Then share in the joy of the ‘harvest home’. Lord of the harvest, you only know the vastness and the greatness of the need. We long to know more of the height and depth, the length and breadth of your love. But there are millions who know nothing of the gospel at all. I pray that in grace and with urgency you would raise up and send out labourers into the harvest fields around me, in my country, in lands where there is already a harvest, and places where your name is hardly known. I pray in the name of Jesus. Amen. The greatest act of friendship is to introduce some­one to Jesus Christ. In Christ, there is reconciliation to God, forgiveness, new life and blessings untold. To keep silent when people need to hear the gospel seems sinful and selfish. It is not sufficient to argue that we witness with deeds, and not words. Time and again we read that Jesus opened his mouth and began to speak, and so should we. To bring people to Jesus takes persistence and faith. We will want to be winsome, endearing and kind, but we also need to be bold and courageous, not afraid of the reaction of the unsympathetic, but looking for the smile of God on our determination to bring people to Jesus. None but you can do. There’s a work for Jesus none but you can do. Tell them of your King. Gracious God and Heavenly Father, I desire that I would be used in the great work of bringing men and women to the Lord Jesus, so that they would find his grace, guidance and gladness, his eternal life. I do not expect this to be easy, but it is your work and therefore I ask for your compassionate heart and your persistent strength to be involved in the task of winning people for Jesus. Amen.